Sometimes a couple may do Wills that mirror one another. There is no agreement between the two of them. It just so happens that they are identical Wills. 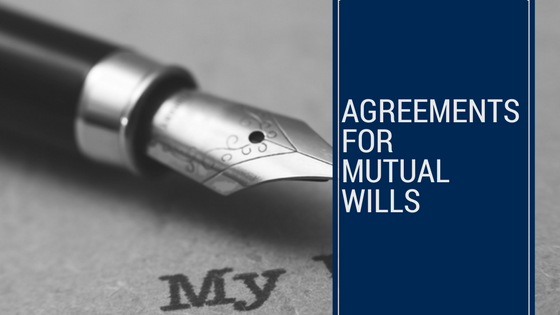 Sometimes people for a whole range of reasons enter into agreements where they agree that they will do Wills in a certain format and that they will not revoke those Wills without agreement. That is the essence of an Agreements for Mutual Wills. By way of example lets say John is married to Sarah. John has been married before and has three children of that relationship and Sarah has been married before and has two children of that previous relationship. Further, John and Sarah may do very similar Wills. John’s Will may say if he dies first everything goes to Sarah and Sarah’s Will may say if she dies first everything goes to John. John’s Will may go on to say that if Sarah does not survive him that half of his estate will go to his children, and half of his estate will go to Sarah’s children. Sarah’s Will may provide for a similar outcome if John does not survive her. The answer to the question is that in absence of an Agreement for Mutual Wills nothing will stop Sarah from changing her will and of course in the instance that Sarah dies first in the absence of an Agreement for Mutual Wills, nothing would stop John from cutting Sarah’s children out . An Agreement for Mutual Wills goes a long way to helping protect and preserve an agreement that people enter into and to make sure the children of the first person to die have legal rights to be provided for.